In the morning we packed up and made the hour drive across the lovely Tuscan countryside to Pisa. We parked at the large, free tourist lot and then made our way to the town passing by stand after stand selling tourist kitsch. 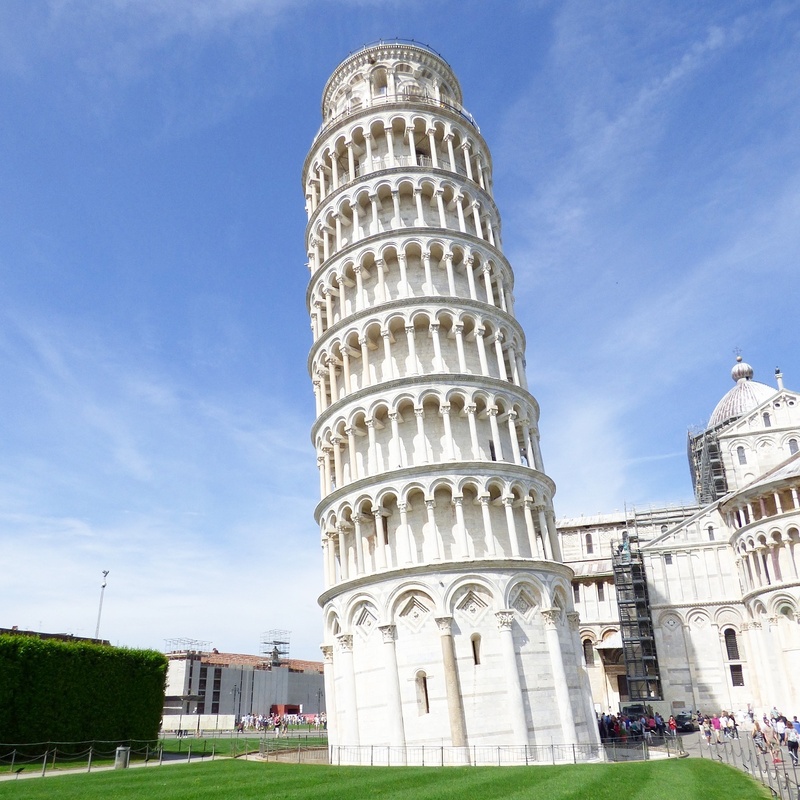 Scattered across the best lawn in Italy are five grand buildings, including the famous Leaning Tower. The other structures include the cathedral, baptistery, a hospital that is now a museum, and a cemetery. All the buildings are constructed from similar materials - bright white marble - and have comparable decoration and styling. The style is called Pisan Romanesque and unlike traditional Romanesque with its heavy, fortress-like feel, the Pisan take on the style is light and elegant. A shot of the cathedral and the tower peeking up behind it from the baptistery. The bronze doors to the cathedral were designed by Bonanno Pisano in the late 12th century and inspired Ghiberti's more famous doors on the baptistery in Florence. Looking up the at the façade of the cathedral. The architect Buschetto created the style of Pisan Romanesque with this church which set the tone for the baptistery and tower. Inside, the relics of Pisa's patron saint, St. Ranieri, lay encased in a silver and glass tomb. The 15-foot tall octagonal pulpit in the nave was by Giovanni Pisano and is incredibly intricately carved. 400 carved figures can be found on the pulpit! The 320 foot long nave was the longest in the world when it was built in 1063. The striped marbled and arches-on-columns give it an exotic, almost mosque like feel, similar to what we saw in Cordoba, Spain. Next it was onto the baptistery, the largest in Italy. The building is 180 feet tall and is topped by a statue of John the Baptist. The interior is known for its wonderful acoustics and we even heard a tour guide singing to show them off. Rising up alongside the cathedral, the famous tower is nearly 200 feet tall and 55 feet wide, weighing 14,000 tons and currently leaning at an angle 15 feet off the vertical axis! It started to lean almost immediately after building began. It was built over two centuries by at least three different architects. You can see how each successive architect tried to correct the leaning problem - once halfway up (after the forth story), and once at the belfry on top. The first stones were laid in 1173 and five years later after they'd finished the base and the first arcade, someone said, "Is it just me, or does that look crooked?" The heavy tower, resting on a very shallow 13 foot foundation, was sinking on the south side into the marshy, unstable soil. (Actually, all the buildings in this complex tilt a little bit). The builders carried on anyway, until they'd finished four stories and then construction suddenly halted. For a century the tower sat half finished and visibly leaning. Around 1272, the next architect continued trying to fix the problem by angling the next three stories backward, in the opposite direction of the lean. 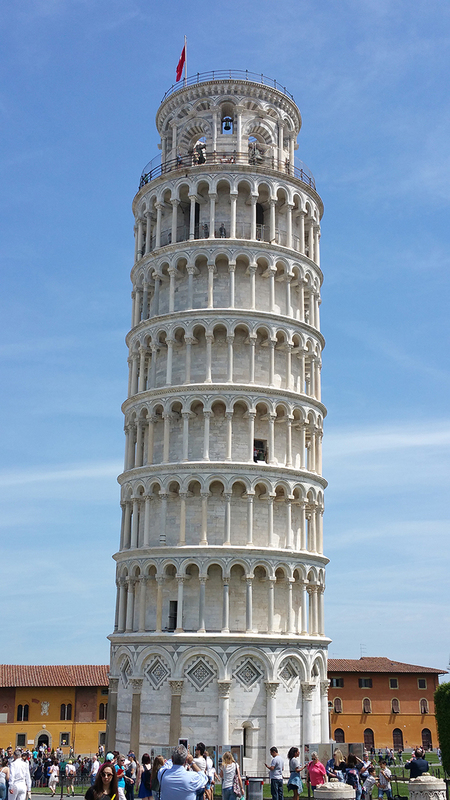 Then, the project stopped again for nearly another century until finally Tommaso Pisano put the belfry on top, also kinking it backward against the lean. Climbing up the tower was an experience! Totally nauseating and totally amazing! Views from the top of the tower. I spy me at the top! Thanks to the tower's lean, there are special trouble spots. The lower south side, which is protected from cleansing rain and wind, is a magnet for dirty airborne particles, while the stone on the upper areas has more decay from eroding wind and rain. The tower, now stabilized, has been thoroughly cleaned. Cracks were filled, and accumulations of dirt removed with carefully formulated atomized water sprays and poultices of various solvents. All the work to shore up, straighten, and clean the tower has probably turned the clock back a few centuries, preventing it's collapse. In fact, art historians figure it leans today as much as it did when Galileo did his famous gravity experiments from the tower 400 years ago. While it was very crowded, we loved the Field of Miracles, and the Leaning Tower in particular. But, we also wanted to see what else Pisa had to offer so we walked into the heart of town, loosely following a Rick Steves self-guided walk. Pisa is pretty small, with just 100,000 people today, but historically it was a powerhouse. In A.D. 1200, Pisa's power peaked and for nearly three centuries, Pisa rivaled Venice and Genoa as a sea-trading power. European Crusaders hired Pisan boats to carry them to the Holy Land and Pisa's 150-foot galleys cruised the Mediterranean gaining outposts on Corsica, Sardinia, and Sicily. The Pisan republic prided itself on its independence from both pope's and emperors. It was during this golden age that the great monuments at the Field of Miracles were built. Eventually, Pisa's power subsided after a route in battle against Genoa and their port silted up. 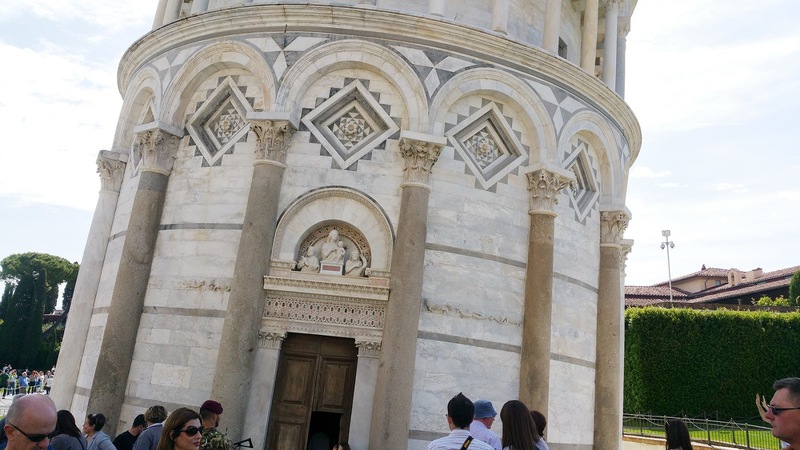 Today, Pisa is a university town with 45,000 students calling it home. The Piazza dei Cavalieri and the decorated palace. This piazza was once the seat of the independent Pisan government. In around 1500, Florence conquered Pisa and the Medici family took over as rulers. The Arno river, just down stream from Florence. The Ponte di Mezzo is a modern bridge constructed on the same site where the Romans built one and marks the center of Pisa. Even the buildings along the river banks lean like the Leaning Tower, because the entire city sits on shifting delta sand. When did Jane turn 17? Stop growing up so fast kids! Another example of the wonderful Pisan Romanesque architecture. The old clock on Piazza dei Cavalieri. Layers and layers of peeling paint. Our family in Pisa on Thursday May 26th 2016. The valentine's day bouquet I sent to my love. I ordered it at 11:00am and it was delivered at 2pm!!! So beautiful! Simply stunning Deliver Flowers! I will definitely be bringing my business back to this gem of a florist.